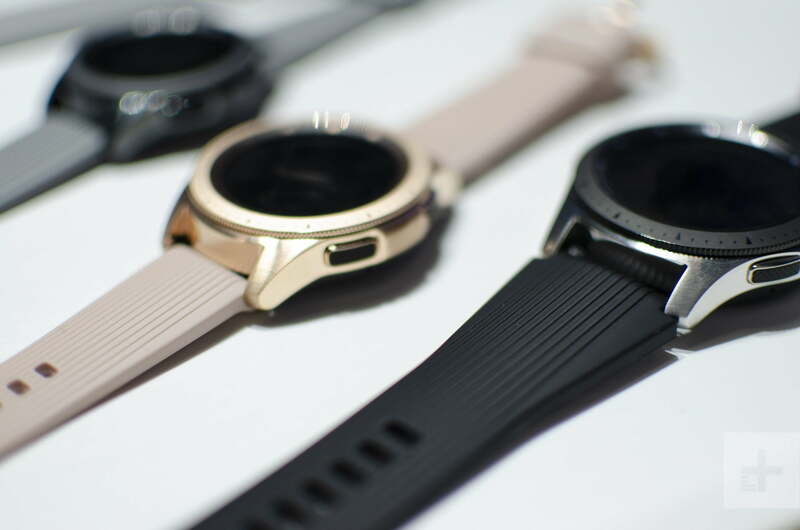 Battery life has always been the Achilles heel of smartwatches. Charging an extra device every evening is annoying enough, but it’s even worse when that device can’t even survive the day, and you end up with a dead watch on your wrist. 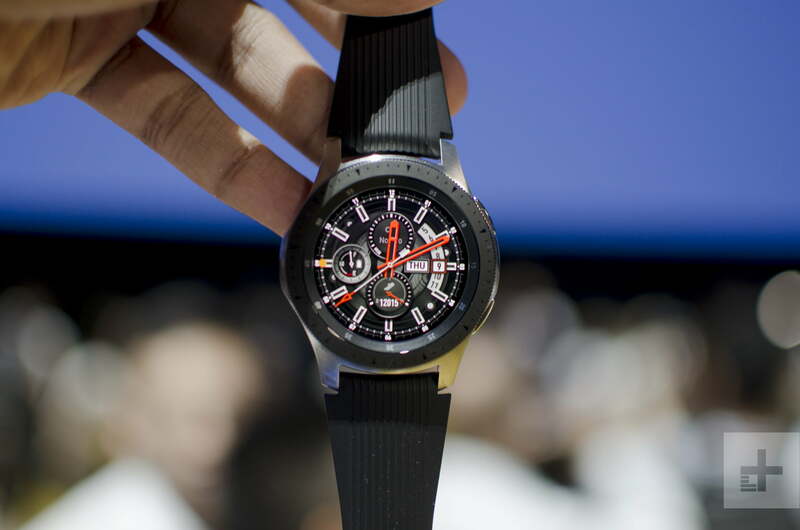 Samsung is trying to fix that with its new Galaxy Watch, a successor to the Gear S3 and the Gear Sport. We’ve spent some time with the watch at Samsung’s Galaxy Unpacked event in New York City, and here’s what it’s like. 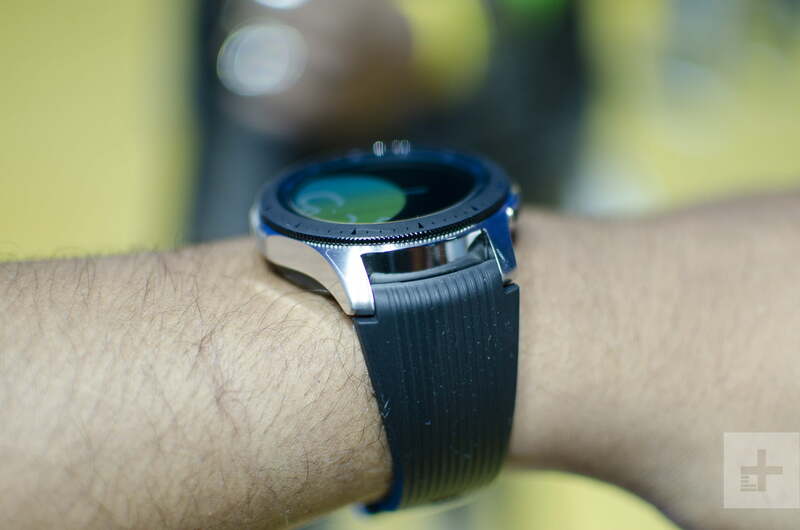 The Galaxy Watch retains one of the best features of Samsung’s smartwatches — a rotating bezel to control the user interface. It’s still just as satisfying to rotate, like twisting the dial on a combination padlock. 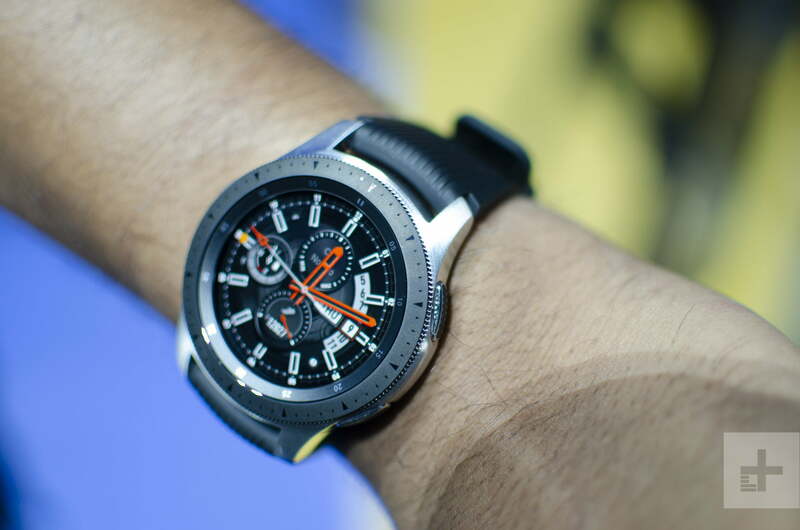 Samsung has gone with a sporty look, with markers around the bezel of the watch, and an inner bezel that slopes into the screen with markers for every 5 minutes. 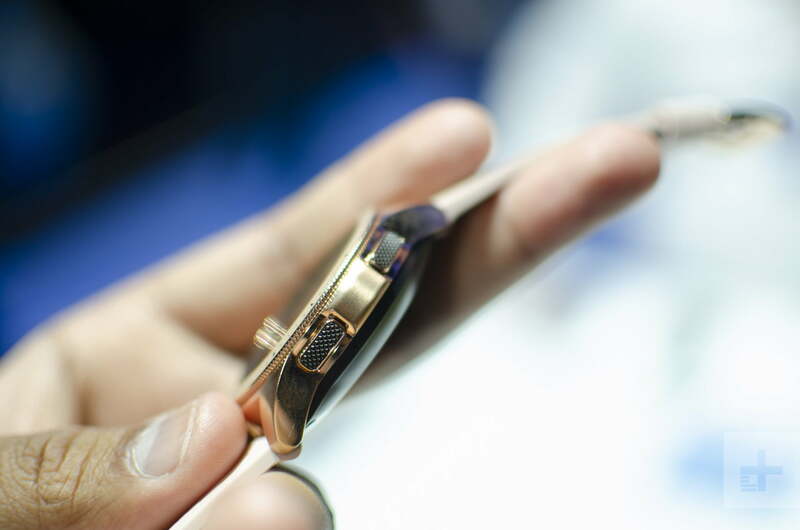 Two elongated buttons on the right edge act as a back and home button, and the lugs slope down to eliminate the usual gap between the strap and the wrist. It’s a watch that can look at home in the gym, but won’t feel out of place in the office. A wide variety of watch faces to choose from mean you can personalize the Galaxy Watch to your liking. Some of the watch faces will trick you into thinking you’re looking at a real, analog watch. 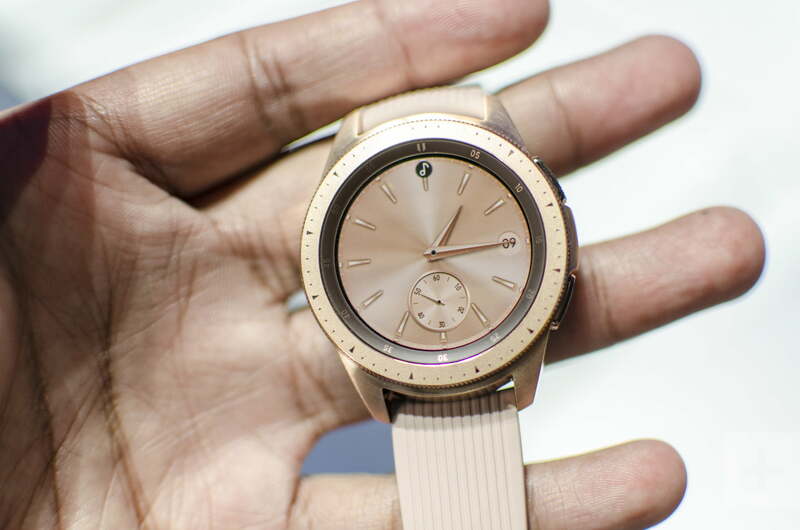 There are two size options: A 46mm in silver, and a 42mm in black and rose gold. The larger variant uses 22mm straps, while the smaller watch allows 20mm straps. The default straps on the models we looked at are made of high-quality silicone: ideal for when you get sweaty. The straps are interchangeable, so you can really just add whatever you fancy. The 46mm Galaxy Watch has a 1.3-inch Super AMOLED screen with a 360 x 360 resolution, and it’s protected by Corning’s Gorilla DX+ glass. The smaller 42mm model has a 1.2-inch Super AMOLED with the same resolution and glass. The blacks on the screen are so incredibly deep that some watch faces will trick you into thinking you’re looking at a real, analog watch. The colors are vibrant, and it was bright enough to see in the area we were in, but we’ll have to do more testing to see how it fares outdoors. Both watches feel relatively lightweight and supremely comfortable on the wrist, though people with smaller wrists may prefer the 42mm model. 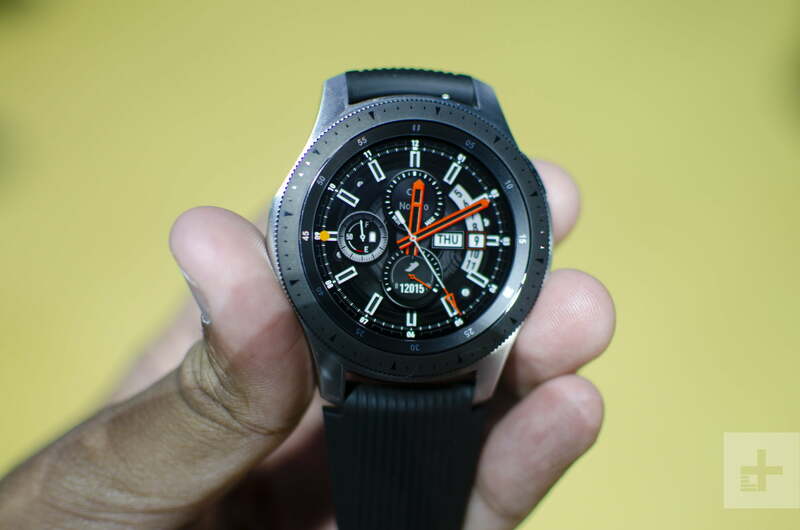 The Galaxy Watch is powered by a dual-core 1.5GHz processor with 768MB of RAM, and it runs version 4.0 of Samsung’s Tizen wearable operating system. Rotating the bezel to move throughout the interface is quick, and we ran into no slowdowns opening apps, though we’ll need to do more rigorous testing. It’s paired with 4GB of internal storage, in case you want to store some music for a run or workout without your phone. Spotify integration is also new, allowing you to listen to songs offline or without a phone. The Galaxy Watch can automatically detect six workouts, such as walking, running, and cycling. 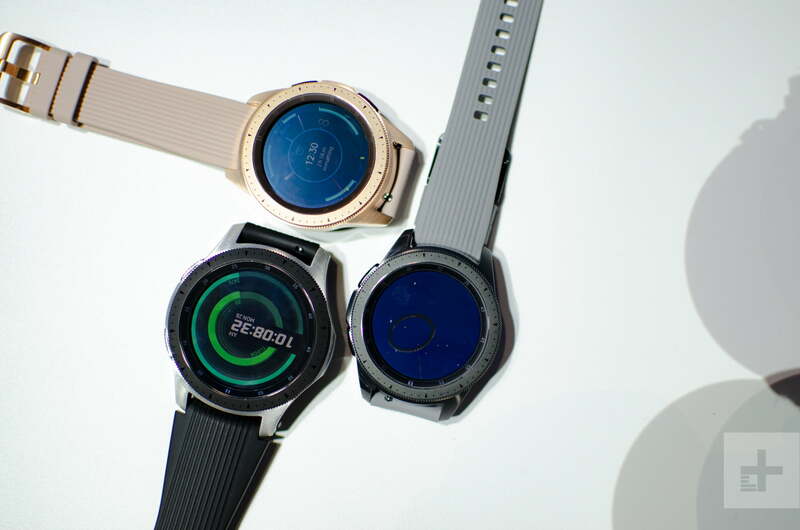 New fitness features will be a major draw for anyone considering the Galaxy Watch over a dedicated fitness tracker. A breathing exercise mode lets you monitor your stress levels and helps calm you down, similar to what you can find on a Fitbit. You can also continuously monitor your heart rate, and the watch can automatically detect six workouts, such as walking, running, and cycling. There are 21 new indoor exercises, and an overall list of 39 activities. We’ll be working out with this watch to put it through its paces. Thanks to an internal microphone, the Galaxy Watch also responds to voice commands via Samsung’s Bixby virtual assistant. It could come in handy for controlling smart-home devices, but we wish Samsung would give up on Bixby and just use Google Assistant like everyone else. You’ll still be able to connect the watch to most Android and iOS devices, which allows you to interact with or dismiss notifications, and more. Perhaps what’s most interesting, however, is the Galaxy Watch’s battery life. 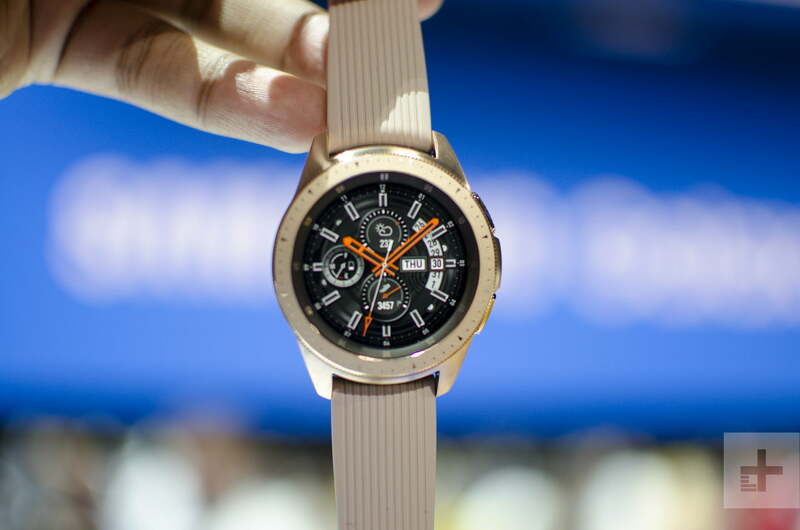 Samsung claims the 46mm model can last around four to six days due to a huge 472mAh battery and processor optimizations — impressive for a smartwatch. This depends on your usage, though, so constantly running workout tracking and the heart-rate monitor will deplete the battery much quicker. Sadly, it doesn’t look like these battery claims apply to the 42mm model, which only has a 270mAh battery. We’re not sure what Samsung is claiming battery life is on this model, but we’d be happy with at least two to three days. The 46mm Galaxy Watch costs $350, and the smaller model will cost $330 — both will be available starting August 24 from Amazon, Best Buy, and Samsung’s website. Pre-orders kick off on August 10. There’s also an LTE model coming later this year, and it will be supported by AT&T, T-Mobile, Sprint, and Verizon. Prices will vary by carrier. You’ll be able to place calls and stream music with this model — all without the need of a smartphone. The Galaxy Watch looks like a solid upgrade over the Gear Sport or the Gear S3, but what we’ll mostly be looking at is if it can deliver four to six days of battery life. If it can, then Samsung may have a real winner here.